With two decades of mailing lists and related cultural practices, we have seen networks rise, disintegrate, or become rather resilient. Long term contributors to lists like bricolabs may see the network as an affective element that not only enables free sharing of information and concepts, but also expresses degrees of belonging to a hybrid of social relations, sets of idea(l)s and physically bound practice. The idea of network culture also builds on peer to peer collaborative approaches enshrined within free and open software communities. Since these lists and networks are on one level placeless, if not unbound of places, the question is – belonging where? What kind of ‘bind’ is this affective relationship, and how does it configure place relations, and ultimately, another way of looking at geopolitics? Can networked practices be both grounded in various localities and unbound simultaneously, growing stronger as they mutually configure? During the day’s panel discussions we offer concrete examples of projects which can reconfigure understanding of geo-politics and discuss collaborative, micro-structures and translocal activities which span, reflect and elide traditional dichotomies of east and west, north and south. But how do these networks survive and sustain their usefulness? Introduction to the event and Welcome from Bricolist co-founder Felipe Fonseca. How do projects which are translocal by “nature” impact on power politics aligned in the “old school” grids of North and South? With Alejo Duque, Irene Agrivine, Natacha Roussel, Camilo Cantor. Introduced and moderated by Tapio Mäkelä. With John Hopkins, James Wallbank and Brian Degger; Plus Q/A; moderated by Paula Vélez. How do brico-labs operate within national and regional constraints? What does the ‘diy ethos’mean? What does it mean to be sustainable? With Kruno Jost, Kasia Molga, Ivan Henriques, Jerneja Rebernak & Q/A. Moderated by Felipe Fonseca. This panel brings together local Helsinki development specialists and international festival guests working with open source culture in the Africa, Asia and South Americas. It aims at discussing creative developmental approaches and the role of open source culture in supporting them. The development of open source software has become widely regarded as a new model of peer-based collaboration. The panel asks, which ideas and methods from the open-source-methodology can be applied in the context of poor countries and regions? What can ‘development’ mean if past mistakes are to be avoided? Which models and projects do already exist and what can we learn from them? With Amrit Naresh (r0g), Tuulia Virhiä (Plan International), Ruby van der Wekken (Stadin Aikapankki, Siemenpuu foundation and Commons.fi), Peter Kuria (Helsinki African Film Festival and Shaling.org) and Felipe Fonseca (Bricolabs). The panel will be moderated by Armin Medosch (AT). From morning until evening, ‘Frenetic Little Labs of Communications’ will be held giving remote participants across the world a chance to connect to the Helsinki dialogues. It is convened by Victoria Sinclair of Northern Ireland who will be in Bolivia working with Alejo Duque of Colombia who will be in Finland tuning in bricolabs members in Bolivia, Indonesia, Mexico, Pakistan and elsewhere, discussing low tech solutions, co-creation and knowledge sharing beyond North-South dichotomies. Fabiane Borges holds a doctorate in psychology and is an essayist and artist. She is interested in space research, art movements, urban intervention, and networks of art and technology. She has written two books: Domínios do Demasiado and Breviário de Pornografia Esquizotrans.... Increasingly, she is approaching fiction and dreams of having a spaceship. Her thesis is about Spacial Culture. Alejandro (Alejo) Duque (Colombia-Switzerland) is a PhD candidate at the European Graduate School; his research is entitled: Gifted Malice, Kinship Through the Wires and the Waves. Bronac Ferran is a writer, curator and researcher. She lives in London and works part-time at the Royal College of Art. 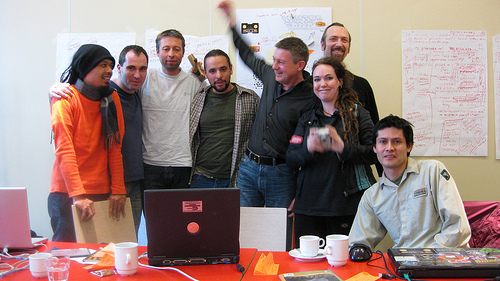 The bricolabs network emerged as a consequence of bronac and Rob Van Kranenburg both being in Sao Paulo in November 2006 where they met Felipe Fonseca and decided to create a mailing list to build links between people they knew working in diy, free and open lab structures. Felipe Fonseca is a Brasilian media activist and researcher working with technological appropriation, low tech experimentation, free (livre) and open source multimedia software, open licensing and online collaboration. Felipe has helped to develop MetaReciclagem, which gathers people and projects related to the deconstruction of information technologies; DesCentro, a de-centralized research organisation; and Bricolabs, an international network of experimental labs. He has acted also as a consultant for the Brasilian Ministry of Culture in the Cultura Digital project, which built ICT use in more than 600 cultural centers throughout Brazil and worked with weblab, building collaborative online networks and developing projects such as Lixo Eletrônico, a weblog about e-waste, Mutirão da Gambiarra, a series of publications about the MetaReciclagem network and also with the Brasilian Ministry of Culture articulated a collaborative strategy for experimental labs called Redelabs. He is currently doing a Masters at University of Campinhas, Sao Paulo State. Felipe has led the bricolabs party to Pixelache, 2013. Ivan Henriques is a transdisciplinary artist and researcher working in multimedia installations examining different perceptions of time, memory and environment. He explores in his works hybrids of nature and (technological) culture creating new forms of communication between humans and other living organisms, considering nature as inspiration and a necessary factor in the development of the technological world. Henriques holds MA in ArtScience Interfaculty at the Royal Academy of Arts and Royal Conservatoire of Music, The Hague (NL). House of Natural Fiber: The House of Natural Fiber, is an open digital cultures community, based in Yogyakarta, Indonesia. It is both a digital and on-the-ground flesh-based collective engaged in an active worldwide practice to foster democratic, artistic and open means of creative expression and innovative collaboration. Since 1999 HONF has focused on the social and cultural intersections between art, science and technology, running numerous art projects and workshops within the framework of their Education Focus Program (EFP). Developed as an independent curriculum for HONF's activities, EFP concentrates on interdisciplinary scientific exchange on the critical analysis of the circumstances that move Indonesia's post-dictatorship society. Kruno Jošt studied painting at Art Academy Zagreb, Free Direction at Gerrit Rietveld Kunstakademie in Amsterdam and holds an MFA in new media arts at Transart Institute. Using transdisciplinary discourses while researching connections between art, culture, new/old technologies, humanities and consciousness he works in media of sound, video, performance, installation, on-line archives (blog, video and photo archives and interactive works). Jošt is interested in culture jamming, artivism, detournament, social interventions, media hacks, dialogic art and relational aesthetics. Themes he elaborates are milieu control, protocols, manipulation, freedom and systems. He works in all applicable media to create a "social sculpture" where emphasis is on non-conventional when embracing and initiating creative group efforts. Jošt is acting through GenteJunk since 2006, collaborating on multimedia participatory works and in improvised music collectives: Impromondays, Live Noise Tupi and Noise Wall. He was one of the founders and editors of magazine for culture 04 - Megazine for Reality Hacking, one of the founders of Internet radio network Free Radio: Station MIR (FRSM), and running GentleJunk NetLabel for non-conventional sound and music. He initiated ongoing research on exchange in free and open culture between Brazil and Croatia and New Media Cross-Border project focusing on cross border issues between Croatia and Slovenia in new media arts and transdisciplinarity. He received Croatian Ministry of Culture award for best collaborative electronic audio work in 2007 and first prize for best locative collaborative work at Arte.mov festival in Belo Horizonte in Brazil 2009. Armin Medoshworks as a practitioner, curator and writer in expanded media art practices since the 1980s. Living in Austria, Germany and the UK, he has contributed to the practice and discourse on art and technology as a curator of exhibitions, convenor of conferences, critic and theorist. He has recently been awarded the degree of Ph.D. in Arts and Computational Technology at Goldsmiths, University of London. Kasia Molga is a media artist whose practice is concerned with changes in our perception and relationship with the planet in the increasingly technologically mediated world. She deals with real time environment (and not only) data visualisation - where the data becomes a pretext, motor and platform behind the work. In her work she reaches out to networked, geo-locative and sensory technologies in order to explore diverse aspects of transmitting, visualising and sharing real time data whilst striving to promote the appropriation of new technologies within the disciplines of art and science.Places she has exhibited among others: Ars Electronica 2012 (honorary mention) (Linz, Austria), TRANSNATURAL (NL), Meta.Morf (NO), ISEA (Istanbul, Turkey), Translife Media Arts Triennial (Beijing, China), MIS (Sao Paulo, BR), Dutch Design Week (NL), MOMA (NY).Kasia is a funding member of Protei Collective, holds MA in Interdisciplinary Design Studies (Central Saint Martin College of Arts and Design), previously studying Art and Animation (Academy of Fine Arts in Poznan, Poland). She guest lectures, present at conferences and publish papers regularly. Amrit Naresh has been a research consultant for OpenOil since October 2011. He has been involved in the OpenOil wiki projects with a special emphasis on East Africa and Iraq, and has contributed advocacy work on the Extractive Industries Transparency Initiative (EITI) in the United States. He also blogs on each of these topics. He has led MediaWiki trainings in Baghdad and Kampala, as a consultant with Uganda Radio Network (URN). A similar project in South Sudan will commence in mid 2013. Amrit graduated from the University of California, Los Angeles with a BA (Hons) in Comparative Literature and German Intellectual History. Jerneja Rebernak is the programme manager of KSEVT - The Cultural Centre of European Space Technologies. She worked in Singapore at the Asia-Europe Foundation and she was international programme coordinator for the European Capital of Culture – Maribor 2012. She has recently attended the expert meeting on cultural mobility in the Mediterranean organized by Roberto Cimetta Fund in Beirut, Lebanon. She holds an MA in Media Studies and a BA in Communication Science respectively from the University of Amsterdam and Ljubljana. Natacha Roussel creates organic like haptic interfaces involving one or several users they can be body extension or come as close to the body to being a garment. She develops an independant practice in Canadian art centres where she showed and was hosted in residencies(Dare-Dare, Est Nord Est, théâtre la chapelle) supported by Quebec and Canada art Council bursaries (2001,2004,2006). Also in France where (ARCADI 2009, Dicream 2011). Pursuing research in interactive design she develops interactive garments, with a Bursary from CIAM (hexagram), showed those projects at Digifest04 (Toronto) Banff new media (Ca), Extra Sensory (Centre des Arts d'Enghien, Paris)In 2008 she starts a PHD at Planetary Collegium, and finally achieves currently this process at UParis 1 on the topic of instable perceptual implications in multiusers haptic installations; based on the project interac wearing. This project uses networked x-bee costumes to creates sound links between several people walking in the city according to their personnal rythms and perceptions. Widely published in both academic and artistic context. Always searching for alternative forms of organisation, she founded the collective Experientiae Electricae (2003), that has integrated technologies based on rudimentary electronic principles leading to multimedia work. However she is currently more involved in informal setups between people and while she currently is based in Brussels she gets involved with open source networks such as Constant ASBL. Victoria Sinclair (Bricolabs network, Non-executive Director Co-Lab CIC, founder ArcSpace Manchester) is a researcher, social entrepreneur, artist, holistic therapies practitioner and network culture and alternative currencies advocate. For the last 7 years Vicky has been working extensively in Latin America to develop grassroots knowledge-sharing and p2p innovation whilst continuing her apprenticeship with plant medicines and technoshamanism. Currently her main projects surround telepresence activities for arts, rehabilitation, and network development and research for her MSc in Transpersonal Psychology, Consciousness and Spirituality.